A big African hello to everyone! Thankfully, most of them have at least one name we can say and possibly remember. There is Favor, Josephine, Andrew and Junior. When we arrived, we could tell that the older kids did not know what to expect and were sitting stiffly on the couch with their scriptures in hand. Luckily, the kids are bilingual so we could communicate in English. We started by talking about differences and similarities of each kid in the family and how their parents really love them even though they are not exactly alike. We sang “I Am a Child of God” and talked about how all of us are part of Heavenly Father’s family. He loves us even though we are all different, and we are all an important part of His family. We then played “Don’t Eat Pete”, ate chocolate cupcakes and drank beesap. All of the kids we play “Don’t Eat Pete” with think it is great and we have a lot of fun. Another game that we play is “Catch the Mouse”. All of the players sit at a table with a string tied on a little wooden block. All of the blocks are arranged in a circle in the middle of the table and one person is it, holding a funnel. He rolls a dice and if it rolls a one or a six everyone pulls their “mouse” out as fast as they can and the one with the funnel tries to catch it under the funnel. Even the parents have a great time. 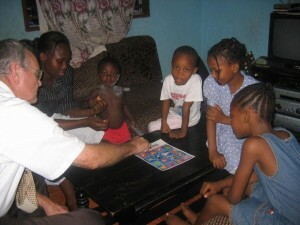 I don’t think the kids and parents have played many silly games together so it is a good learning experience for both. 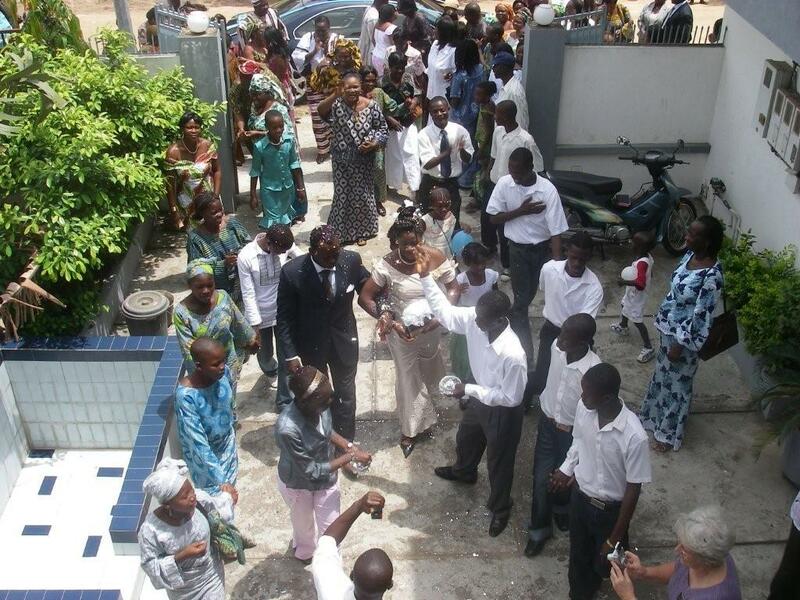 Thursday brought some excitement as three new elders arrived in Cotonou. Elder Fontaine is from France, Elder Olsen from Ontario Canada and Elder Skouson is from Richland Washington. 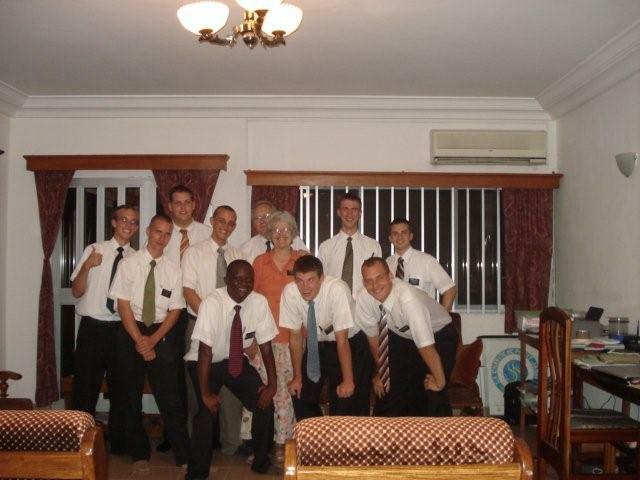 Elder Skouson has some San Juan County roots as his grandparents are Garth and Sandra Skouson from Monticello. This brings us up to 9 elders now so we have one 3 some which is difficult but we will live with it for a while. Our airport experiences are always interesting. We had word that the elders were to arrive at the airport about 7:00 in the evening so some of us went down to meet them while Soeur Black stayed home and fixed a spaghetti dinner for their arrival. By the time we waited at the airport for a while and started to ask questions, we became aware that there was not even a flight scheduled to arrive from Ivory Coast until almost 9:00. 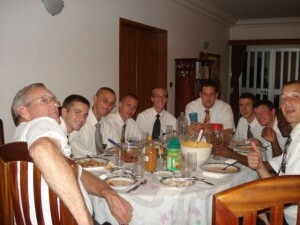 We finally picked them up and got back here by about 10:00 and had a good spaghetti dinner which was welcomed by all the new elders as well as the old. It was a good time to get acquainted and find out about them all. A couple of hours delay wasn’t as bad as when the Findlays left last week and waited at the airport for 9 hours before their plane left. It appears that the times of arrivals and departures are more suggestions than anything else. We had an interesting experience with the Benin Police on Friday. Elder Olsen was actually scheduled to come earlier in the week but he lost his passport in Abidjan so he had to stay until he received a temporary one from the Canadian Embassy in Cote d’Ivorie. When he finally got the passport he didn’t have time to get a Benin VISA so he arrived at the airport with no visa. That was only indirectly what caused the police incident. We took him down on Friday morning and got his Visa straightened out and were returning home. At a traffic light I stopped and then made a free right turn since no traffic was coming, as everyone always does. Unfortunately there was a policeman at the intersection telling me to pull over. I did and he gave me a ticket for turning on a red light. I protested telling him I was quite sure it was legal to do that but he says no, you cannot not unless there is a green arrow. I countered by telling him I was sure you could unless there was a red arrow. He wasn’t real unpleasant about it but he was determined to give me a citation so I said okay. The ticket system is also interesting here. The police give you a little slip of paper, about 2 x 2 telling what the infraction was and keep your carnet which is a little book that amounts to your vehicle registration. The slip of paper replaces the carnet book for a 48 hour period. During that time you have to go to the police station and pay your fine and in theory pick up your carnet book. The problem is, if the police decide it is not important to take your book to the police station then you are not going to get it back and no one is going to help you. In this case, the policeman told me he didn’t have a vehicle to take it to the police station so I would need to go and pay the fine and then bring the receipt back to him to get my book back. I asked him what I would do if he wasn’t there when I got back and that I wanted his name so I would know who to look for if I couldn’t find my book. About that time he handed it back and took back the ticket. He said “this is getting too complicated, just give me something and we will forget it. Without thinking I started to get my wallet out thinking that would be a lot easier than going to the police station. That panicked him a little. He said “not here, get back in your vehicle first.” I got back in and told Elder Olsen, “I think I was just asked for a bribe, should we pay him off or go to the police station.” He said “let’s go to the police station” and I agreed so when he came after his “something” I told him we would take the ticket and go to the police station. At that point, he asked if we were missionaries. I told him we were. Of course he could also see our badges. He said “This is really complicated. I will just tear up the ticket and you can go.” I thanked him and he flagged traffic so I could get back onto the road and away we went. So the count is so far 5 times I have been stopped but only had to pay 1 fine. We have talked about Godwin, one of the young men in the branch who we are helping go on a mission. Elvis has already left but Godwin has not received his call due to passport problems. He washes the pick-up and does little odd jobs for us in return for our help to him. Whenever he is here at mealtime we make sure he is fed. It seems as if he shows up around mealtime quite often but he never asks for food. He has a very minimal job at Tokpa Marche where earns about the equivalent of $60.00 a month. After tithing, rent and taxi rides to work he only has about $10.00 left for everything else. 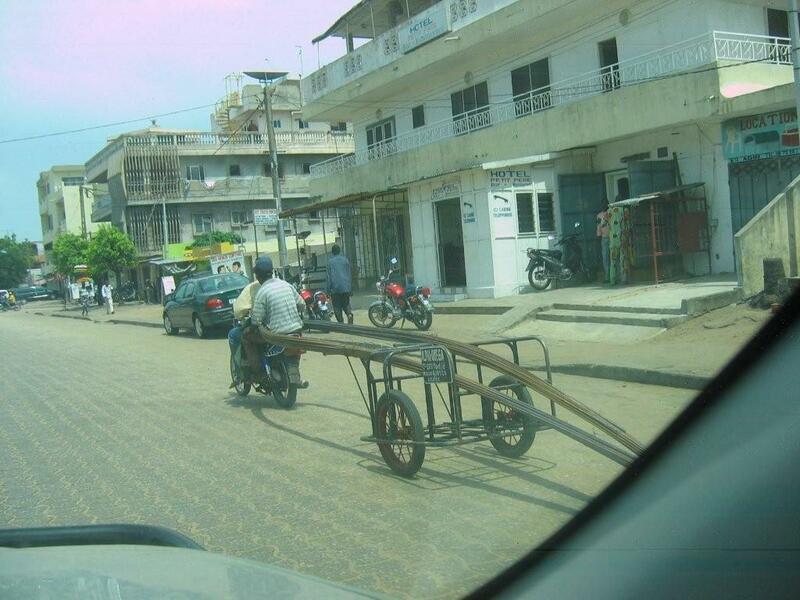 Even in Cotonou that is not very much! He came this morning before work to wash the pick-up and sweep the deck and after breakfast he told me that if it were not for us he would be dead by now. I assume that would have been from starvation. 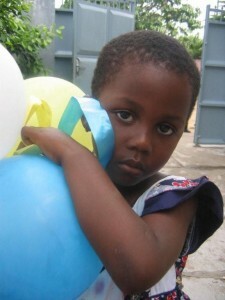 Another tug at my heart strings and I wondered how many more in Cotonou are hungry all of the time. Another time he told me that life was difficult here after I told him of the beating we witnessed. He never complains and is always ready to help others, help clean the church, is the branch clerk. He has a mother but pretty much in name only and that is a story for another day. We count our blessings every day, not only for what we have but what we have learned from living with the people here many of whom we are beginning to really love. In Africa it seems we just get past one crisis when another raises its head. This week it was the chapel. It started out with a demand from a judge that we pay the landlord a lot of money or he would lock up our building. In trying to dig to the bottom of the issue, it seems that the real estate people in Accra had been attempting to negotiate a new contract around the first of the year. When the negotiations didn’t go as planned they apparently just dropped the issue and the rent on the chapel had not been paid since last April. I guess you really couldn’t blame the landlord for being upset but it would have been helpful if he would have just let us know that the rent needed to be paid. Sometimes some people here act kind of like some Americans. It would also have been nice for the people in Accra, who seem to be quite proud of the fact that they are in charge of things, to either have taken care of their responsibility or at least to have notified us that they had failed, but that didn’t happen either. Hopefully after all the going back and forth the problem is now solved, but we don’t know for sure. Maybe we will have church tomorrow and maybe not. On a brighter note, another temple trip was organized for this week, and we had 6 members go over to the temple for a couple of days. Even for the few branch members that have cars, getting in and driving to the temple is not an option. The process was quite interesting to us. We were asked to take them to the road to catch a taxi, so we were at the chapel at 8:00 on Thursday morning with the mission vehicle as agreed. Of the six going, one had decided to go earlier so we had 5 left. Only 2 were there when I arrived. Another showed up a little later and we began a search for the other two. We found them at the Relief Society President’s house finishing the preparations for food to take along. After a couple more trips here and there to pick up forgotten items, we finally got everyone on board and left them at the side of the road leaving town to catch a taxi. With all the suitcases, bags of food, etc. I thought this might be a problem, but after a few minutes negotiation with someone (I suppose a taxi broker) a couple of cars (taxis) stopped and the material was put into the trunks and everyone got in and away they went. I think there are a couple of reasons for this kind of arrangement. First, it is difficult and expensive to cross the borders (of which there are two between here and the temple in Accra) and becomes even more difficult and expensive if you have a car involved. Secondly, cars are very expensive and the people who have them just don’t use them on long distance runs. It is cheaper to get in with someone who does that for a living, ride to the border, cross on foot, and then catch another taxi to go to the next border. To our way of thinking it is strange, but it works in Africa. The group got back on Saturday night. I told them to give us a call when they got here and we would pick hem up and get them home. They did just after dark and were all thrilled with the experience. Paulette Hounkpatin, the mother of Elder Elvis who just left on his mission, was one who went for the first time and really enjoyed going. The temple is a very meaningful experience to these people who seems to have, in general, a little deeper spiritual roots than some other cultures. Another group is already planning to go in November so temple work is really starting to take hold in our little branch. The Findlays left on Saturday to go back to Abidjan to continue with the measles campaign there and will be back here next Friday. I am really glad that we now have the extra bedroom ready for guests. They have spent all week making arrangements with the Ministry of Health for all of the advertising for the campaign. This includes big banners to be placed all over Benin, badges for the vaccinators to wear, flyers for local neighborhoods and TV and radio segments. 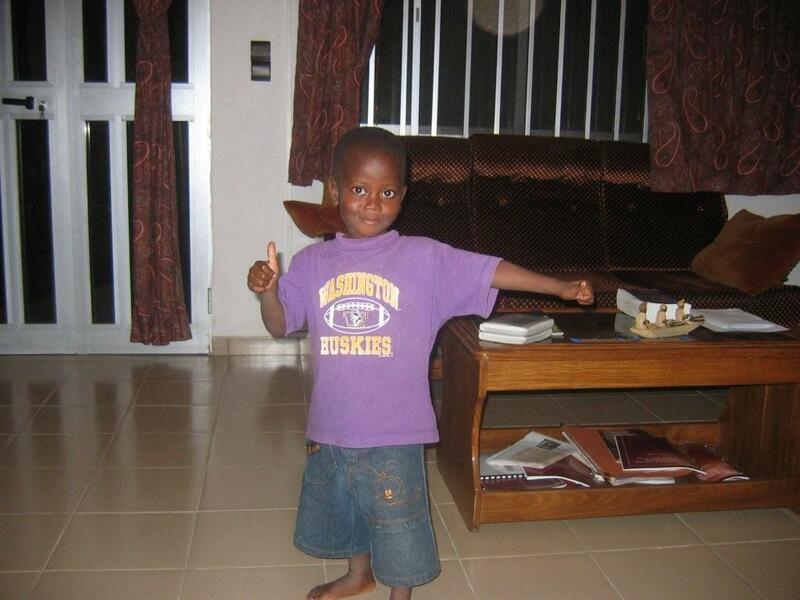 This week Geoffroy, a local volunteer, will find the mothers and children to be in the TV advertisement. I helped him choose some from the branch today so that will be exciting to see some familiar faces on TV, that is if we had a TV. But we will get a DVD of the advertisement. When we are involved in apartment, measles campaign preliminaries, etc., there are generally not very many opportunities for pictures to send home, so I have been saving a few ideas in my head for just such a week. 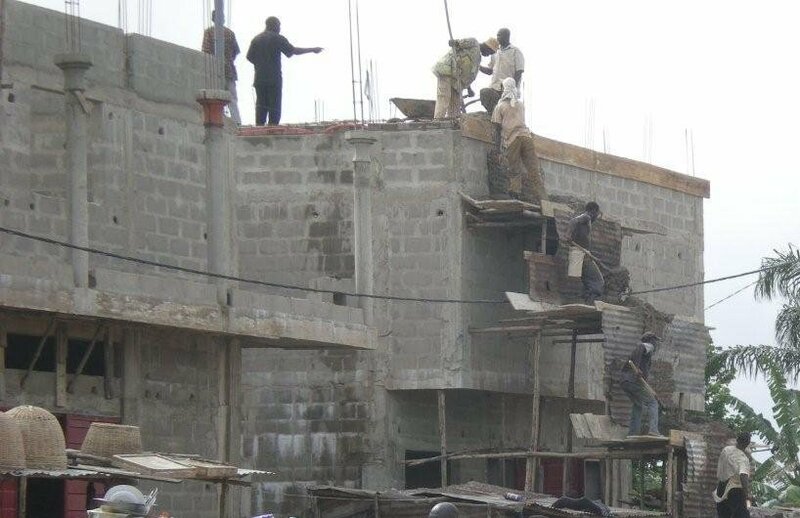 We have mentioned before that there are many unfinished buildings in Benin as people only do the construction as long as they have the money. When their money is gone, they save until they can continue. We have seen buildings that look like they have been sitting for years. Soeur Julianne, in Calavie, is one such example. 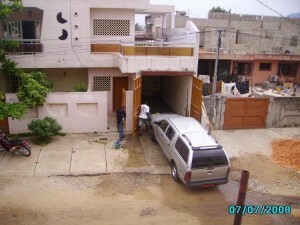 She has been living in a partial finished house for some time now and she was able to put in the electricity and water. When we went there on Thursday, it was exciting to have lights and her sewing machine plugged in. She even showed up with a serger (probably stored in the back room from when they previously lived in Cotonou). There was also a TV and refrigerator that were being used. Before her husband died, they were quite well off as he was a diplomat for the Benin government. After he died, she supported her family with her sewing. They had some land in Calavie that was protected for Julianne so she was able to partially build a house on it. Now back to construction, which we find to be very interesting. Every building is made of cement but you do not see any cement trucks. 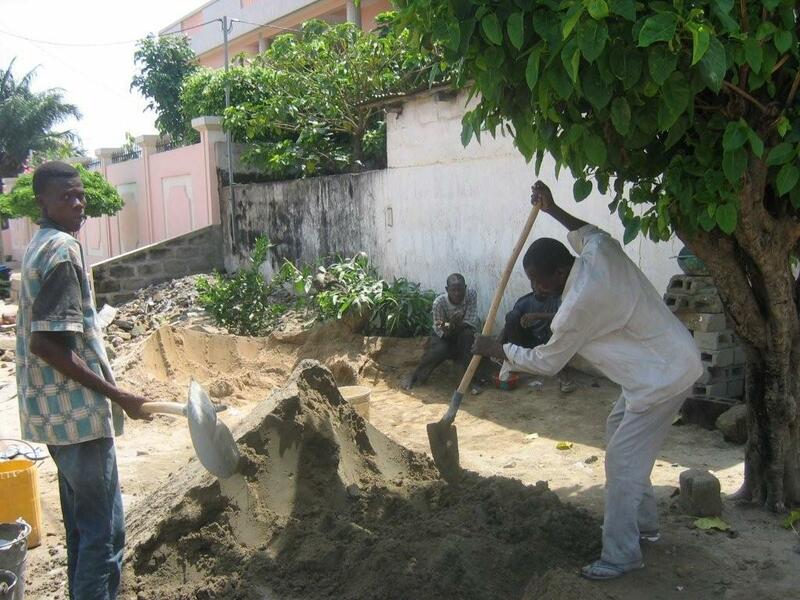 All cement is mixed by hand on the street next to where the building site is. Cement blocks are made by hand where the cement is mixed up and are left to dry before putting in place for the walls of the building. They have a metal mold, fill it up with cement, press it in tightly, remove the mold and let it dry. You see rows of cement blocks all over the streets of Cotonou waiting to be used. It is relatively easy to lay the blocks on the ground level but is a little more difficult on the upper stories but is still done by hand. 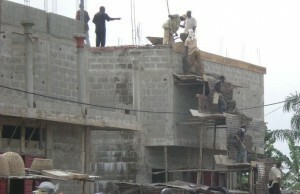 The first step is to pour cement for the next floor above the ground floor. They get hundreds of straight wooden poles to brace up the wood form for the floor, put in rebar for reinforcement and heist the cement up to that floor. The subsequent floors get a little more tricky as when each floor is poured and the walls put in place they must continue upward. This is done by shoveling a scoop of cement by hand up on each level of big stair-like forms until the scoop reaches the floor where it is needed. When blocks are needed on the upper floors they are heisted up from the bottom one at a time on a rope or from one level to the next like the cement. Outside walls, inside walls, kitchen cupboards, fences, you name it and it is made of cement. 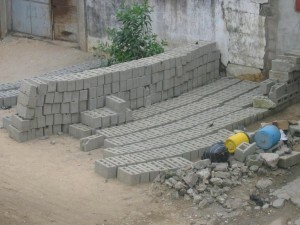 Before painting, a light layer of cement is troweled over the blocks. I hope we never see an earthquake, but the floors never squeak. Last Sunday, a little boy by the name of Regis did not want to go to Primary so we tried to coax him some and tried to convince him to go. We were not being very successful, and he was determined to win the battle. He looked us straight in the eye, bent his arm at the elbow and clamped it down tight next to his body. Without saying a word it is the well understood signal to LEAVE ME ALONE! It can also mean GO AWAY! We have laughed about it all week and think that it is a signal we should adopt in the United States. This week he was happy as could be and was glad to see us. Last week when I was in Missebo Marche with the elders. I was surrounded by about four or five guys wanting me to buy a belt for “Papa”. Well, Papa didn’t need a belt and I was getting a little annoyed so I gave one the clenched elbow to the side signal. He started to laugh and walked away. Pretty effective! There are things that happen here that are heart wrenching and many times we have decided not to share some of them with you and tell mostly of the positive. There is one incident, however, that I think will make all of us more appreciative for the gospel and the freedoms we enjoy, freedoms that sometime we take for granted. One evening we were visiting a member by the name of Alfred Samba when we heard a big commotion in his courtyard followed by horrible screams of a young girl. We could hear huge whacks and lots of screaming. We looked outside and could see many people standing around watching as a man and woman were beating this girl unmercifully on her hands and arms. We could hardly bear to hear any more when Elder Black and Elder Schweiger walked outside and stood there watching. When they discovered that two big Yovos were watching with a displeased look in their faces, they stopped. The woman came over to Elder Schweiger and told him that the girl needed to learn a lesson. There is no 911 to call, no social services to put a child in protective custody, nothing. I had a sick feeling in my stomach all night. Alfred told us that she was a little servant girl and that happened at least twice a month. I think these little servants are more like slaves. Sometimes when a family can’t take care of all of their children, they are given to a family to feed and clothe in return for servant or slave labor. Slavery has been an integral part of the African culture for many centuries. Different tribes have captured neighboring tribes and used their catch for slavery for centuries. In fact, the slaves that were brought to America, England, Brazil, etc. years ago were captured by Africans and traded to the ship captains for ammunition, alcohol, etc. They could not have ended up on the ship without Africans being inhumane to other Africans. One of the goals of the gospel is to try and change some of these things but it won’t happen overnight. Last night Elder and Sister Findlay from Kewlona, British Columbia, Canada arrived for the church-sponsored measles campaign in Benin. The humanitarian division of the church spends millions of dollars each year to help impoverished areas of the world with such things as eradicating measles, drilling deep wells so people can have access to clean water, and assisting when hurricanes, tsunamis, floods, earthquakes, etc. strike unexpectedly. They will be here for one week now laying the ground work with the Ministry of Health to determine where they are most needed. UNICEF is the major sponsor and the church provides auxiliary help with the project by furnishing all of the advertising for the campaign. I was appalled to learn that prior to the inception of this program, about one million children died every year in Africa from measles; that was about 1200 every single day. They will be here for one week and then come back for follow-ups later. We are enjoying have adult conversation and companionship for a while. We have also been enjoying the goodies sent over by Jody in the suitcase the Findlay’s brought and the wireless network and extra computer sent by Steve. Saturday we had a wonderful baptism as one of the traditionally married couples who were civilly married last week were baptized. Also the mother of Carole Somaku, a missionary from Cotonou serving in Ivory Coast, was baptized. Julianne Somaku lives in Calavie and we have been going out there every Thursday for the past four months to visit and teach her. We sent pictures of her in previous blogs when we told about her sewing abilities and when we ate dinner there. Julianne is deaf so we always had to have an interpreter who could read Fon lips not French. She told Nadia, our interpreter, once that she felt bad that she was unable to contribute in any classes because of her deafness so I told her that was exactly how I am because of my lack of French ability. I know how she feels. Sister Julianne is just a very special person who has dealt with a lot of adversity in her life and has come out smiling. You can’t help but like her. She will not be able to make a big contribution to the branch or probably even attend church like she would like to but now she and all her children are members with one on a mission. Elvis and Godwin on Pickup Washing Detail. Last week Soeur Black and I were in a store in the downtown area rounding up things for the elders apartment. I was just standing there kind of watching people come and go while Soeur Black did the serious shopping. About that time a YOVO (white) lady came up and took a good look at my badge. Then she asked me if I was really a missionary of the Church of Jesus Christ of Latter Day Saints. I assured her I was. Once in a while this happens and someone thinks you’re a Jehovah’s Witness or something so I was really surprised when she almost gave me a big hug. She said she was a member of the church from Lyon in France and had been living here for three months looking for the church and had not been able to find anything. She had about decided it did not exist in Benin. She has been a member for a long time and her parents have their call to go to Switzerland and work in the temple there in January. She also knew Christian and Paola really well so we had a good visit for as long as we had time. She was leaving on the plane that evening to go to Lyon for some medical treatment and then will be back about the 1st of November. 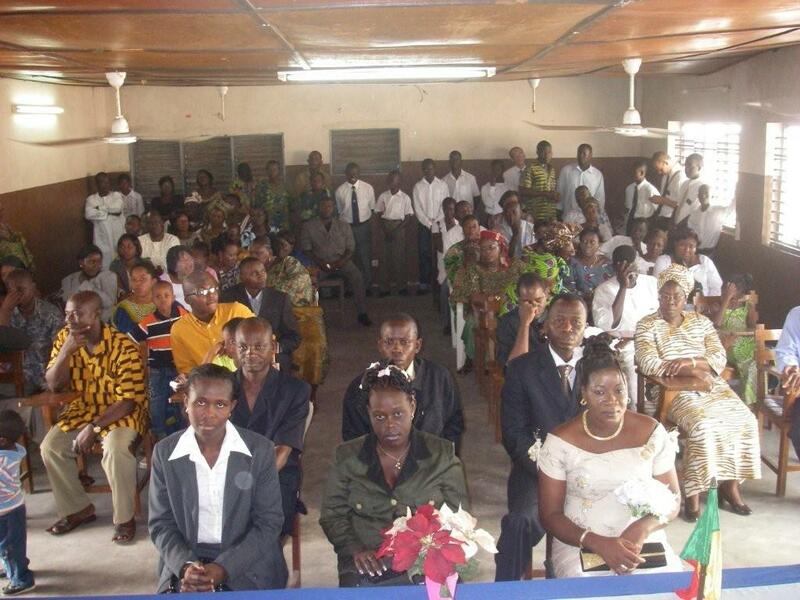 Her husband is an electrical engineer on the power system here in Benin and in Togo and Ghana. He is not a member but she says he is friendly towards the Church. We are looking forward to getting to know them better. For any who might read this that might be better acquainted with Lyon, her name is Miriam (I can’t find my note with her last name). I started to wonder why she just didn’t get on the Internet and get the information on the Church in Benin so I tried. Information is pretty hard to find. So far as any directories or chapel address are concerned there are none in Benin so I wrote a few e-mails trying to get us on the Church map. Hope it works. It probably doesn’t do much good to state that this week was a busy one. Every week is busy and I am sure that is no different than yours at home. Monday and Tuesday were the usual preparations for the visit of President Ayekoue – going to the store, cleaning the house, and Soeur Black doing the usual fretting about what to fix for food. 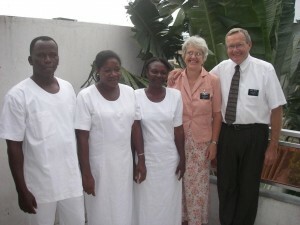 Sister Ayekoue fell and broke her ankle so she and our little Happy did not come. That took some of the pressure off from Soeur Black but not all. On Wednesday morning I picked up President Ayekoue at the airport, and we went directly to an apartment we have located in Akpakpa. Our search for an apartment for the Elders out there has led us to a home right on the main road which would make a wonderful chapel on the bottom floor and a fine elders apartment upstairs. So far everyone is impressed and in favor of renting the property. Now if we can just get Accra to move a little on approval and getting us a check it will be great but that may be a challenge. We have all the paperwork ready for the branch division but it will take probably three months to get it approved, so we have the happy task of trying to convince the church bureaucracy that we need a building for a branch that doesn’t yet exist. You figure our chances. The nice thing is that it is right on the main road going to Lagos Nigeria where a nice sign would be viewed by many thousands of people each day and within walking distance of all the current members out there. We will have to wait and see. Wednesday afternoon we had a wonderful barbecued chicken and baked potato dinner after which we had the zone conference here in our apartment. Thursday was missionary interviews in the morning then member day with a training in the afternoon for branch leadership, which I missed. It seems like I still have a problem with the 24 hour time frame. I keep getting confused with 16:30 being 6:30 instead of 4:30 so I showed up about the time the meeting ended. It was okay. I probably didn’t need to be there anyway. Just a little embarrassing. On Friday I took President Ayekoue to the Togo border and put him in the keeping of the Gillis’ while Soeur Black stayed here and got a running start on the cake baking process for the triple wedding on Saturday – to be talked about later. As we start to get better and better acquainted with the members, their problems and testimonies, we have some really good experiences and learn a lot. Friday evening I didn’t feel all that well and had no sooner gotten the car put away and into the house and taken my shoes off when the doorbell rang. 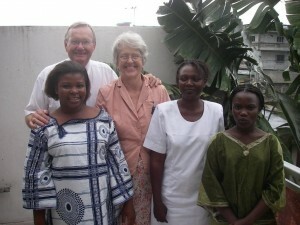 A small delegation of Relief Society Sisters with a young man, Revelon, as their spokesman was at the door. 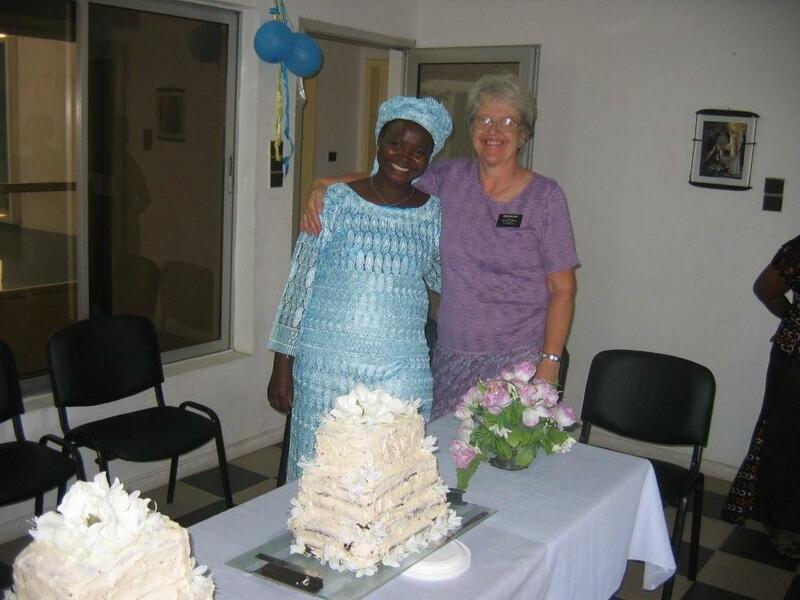 They had volunteered to help Sister Lokossou prepare the food for the wedding and had showed up at the church when the food was being prepared at the Lokossou house. Since they had no way to get there and didn’t know where the Lokossou’s lived, they requested me to drive them out, which I did and all was well. I am not sure why Revelon was there except that he and his sister Christelle always show up whenever anything happens. Revelon is 18 but looks more like 16 or so. Christelle is 14. They are about the same size and look a lot alike. The two seem to be inseparable. You seldom see one without the other. Since there was just the three of us coming back, I started to visit with them a little. I asked them if they did not live out in that area somewhere and they said they did but several miles further out. Since Lokossou’s live probably 4 miles away, I was a little surprised and asked them how they got to Church. They said they come by taxi if they have any money and if not they walk. I asked how long it takes them to walk and they said they could do it in 3 hours if they hurry or if not it takes them 4 hours – ONE WAY. They were not complaining or anything. Just very matter of fact that sometimes they walked. Then I asked about their parents. They said their Dad used to go to Church when they lived closer but then he got sick and lost his job so he got discouraged and quit coming. Their mom goes to another church near their home. They said their parents tried to talk them out of continuing to come to church but they said “we love the church and we are not going to quit coming”. So on a given Sunday, unless they have money for a taxi which they rarely do, they leave their home at least an hour before daylight to begin the 3 hour walk. Revelon is the one I told you about a few weeks ago that usually gives the lesson in the young men’s class even though he is a young man himself. Next Sunday we have an appointment to take them home after church and meet their parents. They can’t be too bad if they are raising kids like Revelon and Christelle. If we can get the branch established in Menontin, it will cut at least an hour or so off their walk. That should help them some. Back to the marriages on Saturday. I better let Soeur Black talk about that. I turned out to be the errand runner, and she was chief cake maker and decorator. 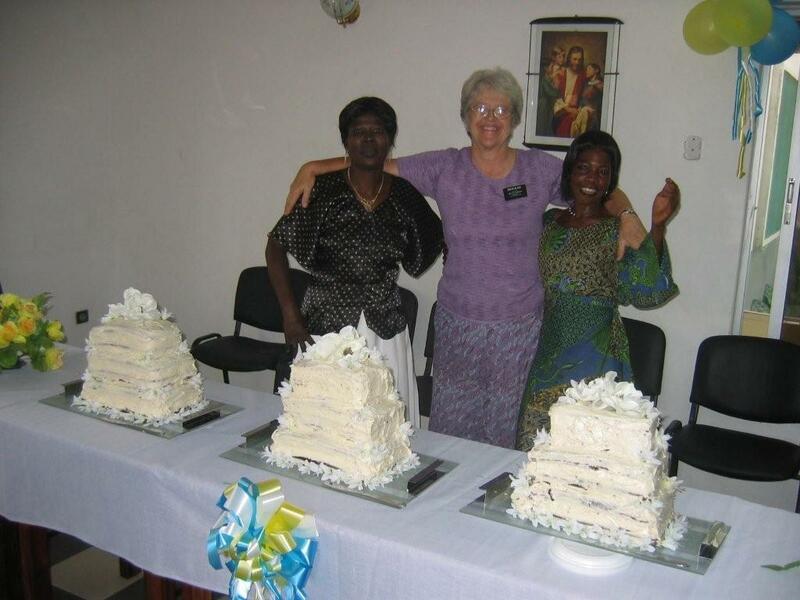 Last Sunday when everyone in the branch was talking about wedding preparations, I (now it is Soeur Black talking) was asked to make the cakes and found out that two weddings had turned into three! I have baked many cakes in my lifetime but never a wedding cake so after an SOS call to Suzie, the planning process began, along with the frustration of trying to find all of the ingredients. I felt very fortunate to find everything we needed, including powdered sugar. That was the first time I saw any in the stores so bought all 10 boxes they had on the self. They wanted chocolate cake which was OK with me until I started to frost the things and then little brown specks of cake got in the frosting. One of the elders said it just looked like little pieces of chocolate chips! We bought glass platters for each cake which looked very nice. I finally got all three frosted, kind of, and decorated with white silk flowers, and they looked somewhat OK, but certainly not up to Blanding standards. We were assured that the wedding would begin at 11:00 at the mayor’s office and they would be at the church by 12:00 so we had the cakes over there by about 11:30. Well, the timeframe was just an obscure wish in someone’s mind as they did not arrive at the church until about 1:30 and then they all went in the chapel for talks from the branch president and friends. That was all just fine except for the cakes. Even with dowels in them (actually sawed off chop sticks) one cake began to lean like the leaning tower of Pisa and the frosting on all of them began to slide off as it was an unusually hot and humid day as it rained the day before. Soon you could see some brown edge lines, but what amazed me was that everyone was raving about them! After the talks everyone, at least 150, was served a great meal prepared by the Relief Society. That too was all just fine except for the cakes. By this time, the electricity was out so there weren’t even fans moving the air around, but the cakes were all still standing. One piece had dislodged from the cake and was laying on the silk flowers around the bottom so I turned the cake around and stuck it in with a broken plastic spoon. Definitely not up to Blanding standards but functional, nevertheless. The worst part was the cutting of the cakes. Soeur Black had envisioned a very orderly cutting procedure into very uniform pieces that would feed everyone attending. After the happy couples did the ceremonial cutting and feeding, she moved in with a couple of helpers to begin serving. Unfortunately, the helpers did not have the same vision, and with a hundred and fifty people pretty much swarming the cake table, Soeur Black’s vision did not last long. The feeding frenzy began! One sister was cutting the cake every which direction, big pieces, little pieces, triangle pieces, square pieces and whatever. Cake was going in every direction. Anyway, after all was over and the frosting cleaned up off the floor, the cakes received rave reviews. Now everyone wants to know how to make chocolate cake. The first obstacle for most is going to be an oven. One sure thing is that from now on, every marriage in the branch is not going to be complete without the ceremonial chocolate cake. Maybe we can improve the serving process. So this week’s challenge to those of you who work in wards at home. Tell the Relief Society that they have to serve a dinner to 150 people with no tables, no stove, no kitchen, no kitchen tools other than what you bring from home, and tell your youth they have to get up and start walking to church an hour before daylight (5:00AM) on Sunday. All that is just another day in Africa.